The term fine dining can bring to mind all sorts of ideas and images. It could refer to the atmosphere of the restaurant, the food that’s served, the overall experience, or perhaps something totally different and unique to your expectations. In short, it can mean something different for each restaurant and patron. 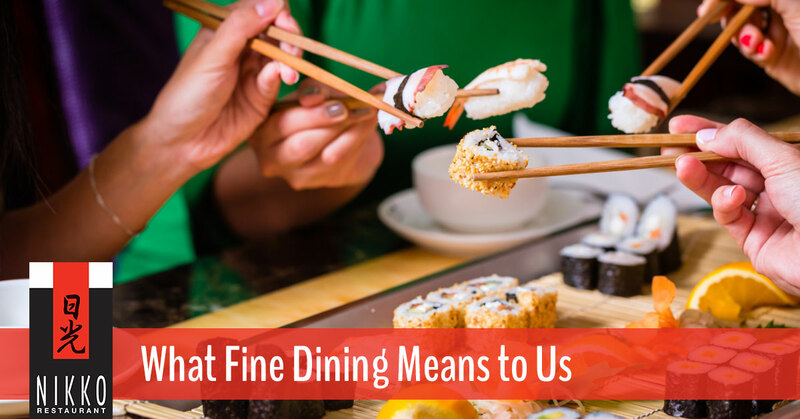 At Nikko Japanese Restaurant, fine dining is something we take very seriously. We are committed to providing the Charlotte area with incredible sushi and Japanese food, and an all-around exceptional fine dining experience. Check out our menu and plan your trip to try some of the best sushi in Charlotte. Read on to learn what fine dining means to us. As we’ve already mentioned, good sushi is a work of art. Because it is such a simple dish with few components, the small details, ingredients, and preparation are incredibly important. We obsess over these details and strive for perfection. What allows us to do this is the pride we take in our work and in serving our customers. Being recently voted “The Best Sushi Experience in Charlotte” has only added to our pride, and we hope that this passion and love is represented in every last detail of your dining experience. Though fine dining is a combination of many factors, a well-crafted menu may very well be the most important part of a fine dining experience. Without outstanding dishes, your restaurant won’t have the foundation it needs to become a fine dining restaurant. At Nikko Japanese Restaurant, we take great pride in our award-winning menu and sharing our creations with you! To get an idea of the beauty of our menu, check out the Japanese food that comes out of our kitchen. While a traditional fine dining atmosphere may include a snooty waiter, white tablecloths, and fine china, modern standards for fine dining are much more open and relative. At the best sushi restaurant in Charlotte, our vibe is reminiscent of an upscale New York City restaurant. We aim to create the type of atmosphere that accentuates the food and offers our visitors an unforgettable experience. Curious about our restaurant’s atmosphere? Check out this gallery of some of our patrons—see if you can spot all the notable faces. No fine dining experience would be complete without superb service. Our staff puts a great deal of thought into creating top-notch customer service. At the end of the day, we always want the customers to feel that the money they spent at our restaurant was well worth it. This is why we strive to go beyond simply taking orders and delivering food. We pay attention to the little details. We are prepared to answer questions about the menu and the preparation process, and our standard is to create an above-and-beyond level of customer service. Ready to see why The Best of Charlotte picked us as the place to go for the “Best Sushi Experience”? Stop in and see us, and we’ll show you what fine dining is all about. We also offer rooms for private parties as well as catering services!